Great skatepark in Central PA. There are many great explanations why 20,000 people use this park each year! Mainly because the skatepark contains dozens of different features that accommodate most skating styles including street and transition. 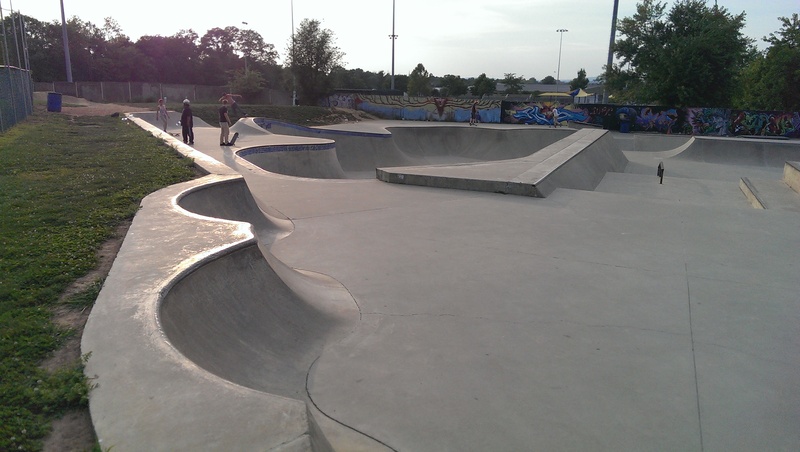 The skatepark has a remarkable layout and mixture of both the street and transition pieces. The skatepark is full of some really great lines. A skateboarder could drop in on the “taco” at the very top of the park, hit the 5 stair hubba, push once, go down the bank ramp, tail slide the quarter pipe and follow that up by doing a lip-slide on the bump to bar; get the point? Stop by the skatepark to see all that Reid Menzer has to offer. Finding an explanation of your own won’t be hard! Park elements include: Taco, Bank Ramp, 5 Stair, 5 Stair Hubbas, Bump to bar, Euro Gap, 4′ Quarter Pipe, 8 Stair, 8 Stair Handrail, Banked Wall, 2 Block, “double D’s”, Out Ledge, Fun Box, Ledges, Small Hubba, Huge Bowl 5-10 foot with over vert pocket, Jersey Wall, Snake Run Ditch, FDR Wall, A Love Seat, Gaps, and Hips. The 360 Expansion Campaign will allow us to add: Rollers, pyramid with box, full pipe, huge jersey wall, banked gap, flat bar, out box, banks, quarter pipe with pop out rail on top, and lights. See 2013 Campaign above for more details.